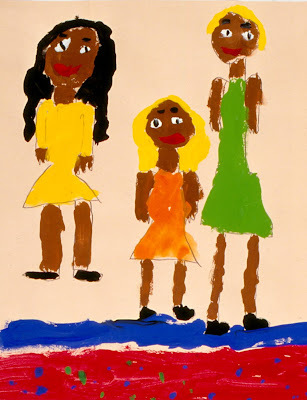 After learning about William H. Johnson and his paintings of the people with whom he grew up in the rural South, the children use his style to paint portraits of themselves or friends. For all ages. Plan 2 sessions. Read about Johnson's life at the Smithsonian American Art Museum, which was given almost all of his work in 1967. Click here to see five examples of his paintings. The book Homecoming: The Art and Life of William H. Johnson is an excellent resource. An artist of many styles, William Johnson is best known for his bold, flat colors and his simple shapes. These are especially apparent in his loving depictions of the people with whom he grew up in the rural South. William Johnson was born in 1901 to an impoverished family in Florence, South Carolina. His father, injured in an accident, could no longer work. His mother took in washing and ironing. The oldest of five children, Johnson worked in the fields and helped look after his younger brothers and sisters. He began copying comic strips at an early age. Too poor for drawing supplies, he often drew with a stick in the dirt. A teacher who saw his drawings recognized his talent and bought him pencils and paper so that he could sketch. When Johnson turned seventeen, he went to New York City to live with his uncle. There he worked and saved his money for several years so that he could attend the tuition-free School of the National Academy of Design. His talents were immediately recognized, and one of his professors collected enough money to send him to Europe to study. There he met and married a Danish artist named Holcha Krake. Together they did their artwork and traveled extensively throughout Europe and North Africa. In 1938, Johnson decided to return to the United States to paint his own people. Over the next eight years, his style of painting changed dramatically. He began using simple shapes and bold, flat colors with little or no shading. While his backgrounds became stark, his pictures took on a loving directness. He has become best known for these paintings inspired by his childhood memories. At the young age of 46, Johnson became ill and spent the last twenty-three years of his life in a hospital. He was never able to paint again. He died in 1970. Become familiar with the life and works of William Johnson. Gather examples of his paintings. Set out pencils and construction paper. Set out paints, brushes, containers of water, and sponges. Display as many examples of Johnson’s paintings as possible. As the children look closely, tell them about his life and work. 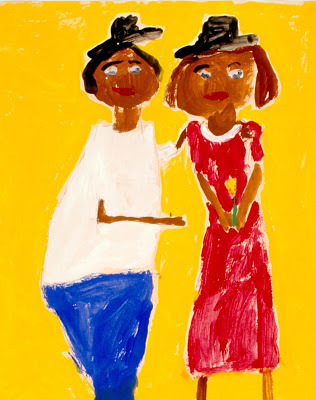 Explain to the children that they will be painting portraits by depicting themselves or friends, using William Johnson’s style. Point out some of the characteristics of Johnson’s paintings: shirts and dresses are broken up into simple rectangular shapes; he used bold, flat patterns, or designs, and colors with little or no shading or variation of light and dark; the backgrounds are simple and stark; the seated people appear to be pasted in front of the bench or chair; he emphasized fingernails and toe nails with white; and he often left out noses. Give the children pencils and paper and have them lightly sketch the basic outline of the figures on their paper. Explain that the pencil lines will be covered with the first layer of paint, so details such as facial features or patterns on the clothing will be added later. 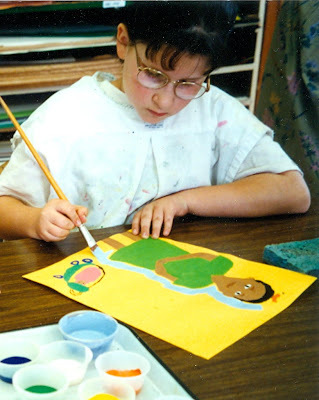 When the outlines of the figures are finished, have the children paint the skin color on the portraits and the first layer of color on the clothing. Display the examples of Johnson’s portraits again. Set out paints, brushes, containers of water and sponges. Review Johnson’s style. Emphasize his bright colors and his use of flat patterns in the clothing. Point out the simple almond-shaped eyes with white and black, his use of white on fingernails and toenails, and his frequent omission of noses. Explain to the children that they can paint their facial features and patterns on the clothing directly on top of the already dried paint. To do this, they should dip into the paint often and lay it on the paper gently. They need to avoid scrubbing with the brush, which will cause the bottom layer of paint to become wet and mix with the top color. Emphasize the importance of drying the brush well after rinsing between colors to keep the tempera paints from becoming too watery. Have the children paint on the whites of the eyes first. As this dries, they can paint the rest of the facial features, hair, nails and any other details or patterns they choose. They can then return to the eyes to paint on the iris color. 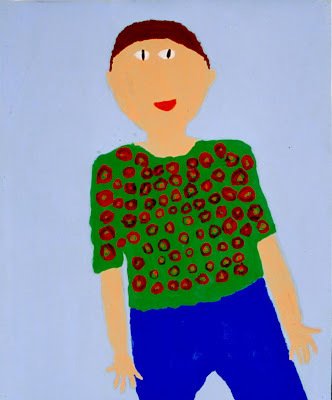 When figures are completely painted, the children should plan a simple background. To guard against covering their figures with the background color, they can leave a little unpainted space around the edges of the figure. Note: When working with children ages 3 to 6, show them the pictures of William Johnson and tell them a little about his life. They should then paint directly onto their papers and let the color of the construction paper serve as their background. Children are attracted to Johnson’s paintings because they have the same spontaneous sense of design as their own artwork. Achieving skin tones can be frustrating for children, so it is helpful to mix them together as a group. Using glass jars so everyone can see, start with white paint and gradually add small amounts of brown, or start with brown paint and gradually add small amounts of white. For a warmer tone, add a dab of yellow. For a darker tone, add a dab of blue. For a reddish tone, add a dab of red. When painting the background, leave a little unpainted space around the figure. The colored construction paper showing through will add to the picture and save many charming portraits from being lost under the background paint. Ask the children to point out areas that specifically illustrate William Johnson’s painting style. Look for areas where the children simplified their shapes in their paintings. Discuss with the children how they felt about using Johnson's style. I didn't see that some of the people were without noses until you told me. Do I have to paint a nose? How many people can we paint in our picture? I have two best friends. I really like “Flower to Teacher." Can I paint one like that? I tried to paint my eye color on before the white part dried. Now it is all running together. You as the artist can decide whether to include a nose or not. You can paint a portrait of yourself and/or your friends. Be sure your figures are large enough to fill the paper. 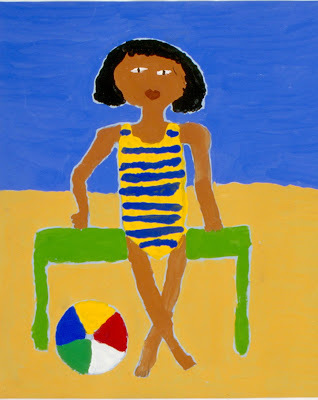 Since you are painting in William Johnson’s style, you can make a painting like his using yourself or your friends. If the color of the eyes ran into the white paint, let the whole area dry. Then you can repaint the white, let it dry, and repaint the color.